J&K Common Entrance Test is an entrance exam conducted by the JKBOPEE (Jammu and Kashmir Board of Professional Entrance Examination). Students applying for this test get admitted into BTech course offered by various colleges and universities in Jammu and Kashmir. This is pen paper-based test, so the students should solve the given question papers and mark the answers on the OMR sheet provided. The total duration for the test will be 3 hours and there’s no chance of extra time being provided to candidates. Physics– This section tests your knowledge of Physics along with problem-solving ability. It covers topics from physics subject of class 11th and class 12th syllabus and any number of questions from each topic can be given for the CET test. Total marks for this section is 60. Chemistry– This section tests your Chemistry knowledge and the topics are covered from the syllabus of class 11th as well as class 12th.Total marks for this section will be of 60 too. Physics and Chemistry are must to do subjects and duration for both inclusive is 2 hours. Maths– This section tests your Mathematics skills and problem-solving ability for the topics of class 11th and class 12th and it is compulsory if you want to join for the engineering course in the state. 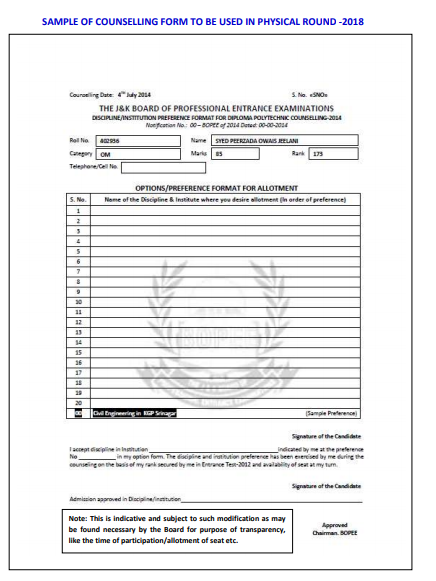 This section consists of a total of 60 marks and candidates will be given 60 minutes to get the answers. 1 mark is awarded for the correct answers and a negative of -0.25 is deducted for the wrong answer. All the questions asked in various sections will be of the Multiple Option type, where the candidate has to choose one correct answer from the choice of four answers provided and mark the same on the OMR Sheet. Before filling any application form, one must check the eligibility required and should fill the form only if they are eligible to avoid rejection from candidature. The aggregate of the above subjects should be a minimum of 50% and relaxation of 10% (i.e., 40%) is given for the students belonging to reserved categories. Candidates should be compulsorily having English as their language subject in the 10+2 passing examination. Students appearing for the 10+2 examination can also apply for the JKCET. Candidates should be of 17 years of age before 31 December 2018. Application Forms are available only through online mode and the candidates have to visit the official website for filling the application form for the JKCET. For the JKCET 2018, the application forms will be available from 1st Feb 2018- 28th Feb 2018. Click on the link provided on the official website and fill the required details there. Click on ‘Generate Application No’ link to get the application number and note it for future reference. Login using your application number and date of birth and fill other details being asked there. Read the instructions and pay the fees for the JKCET through online payment gateways available. Get the receipt for successful transaction and fill the other details being asked like Address or phone number. Upload the photograph and signature etc. and click on the save button. Go through all the details which you have filled and submit the application form. No discrepancies should be found after the application reaches the conducting authorities so re-assure yourself and check all the details once again. You can edit the application form before the given stipulated date. And the payment should be settled along with the application form before the given dates in the official notification. The admit card of JKCET 2018 will be accessible to only those candidates whose’ forms are found to be correct and valid. One can download the admit card on the prescribed date mentioned on the website. After you download the admit card for the JKCET 2018, you have to paste a recent colour photograph of passport size and self-attest the same. The offline facility to collect JKCET 2018 admit card will also be available for candidates if they are not able to get it online. Candidates have to keep their Admit Card till the whole admission procedure completes and there should not be any hampering in the admit card as it is of utmost importance and your candidature will be forfeited if changes or manipulations are found. No candidate shall be allowed to enter the exam hall without possession of a valid Admit Card. Admit cards for JKCET 2018 will be available by the first week of April month. The results are declared by the conducting authorities on the official website, from where candidates can check their results which comprises of their marks obtained in each section of the test along with their category ranks in the JKCET. When the candidates get the notification of the results being published, they can log-on to the official website and enter the required details such as roll no and/or date of birth, to prove their identity after which they will be directed to the page where they can see their results. Make sure that you download the result and keep a hard copy ready so that it is helpful for you during the counselling process. The admission notification for the JKCET was released on the 29th of January, 2018. It can be found on the official website. All details regarding the application procedure, eligibility and more are provided in the notification. The JKCET consists of three different sections, each one consisting 60 questions. The three sections are Mathematics, Physics and Chemistry. All questions are of 11th and 12th standard NCERT level. 5. Declaration of the Results Tentatively on or before the 10th of May,2018. The exam centers for the JKCET will only be located within the state of Jammu and Kashmir. Candidates cannot change their center after the allotment of the hall ticket. The exam will be conducted in a total of 15 exam centers out of which 9 will be located in Srinagar and 6 in the Jammu city ( as per last year’s examination). The options for the examination centers will be given when registering for the examination. All applicants can contact the Help Desk with the following numbers for any queries or guidance needed with respect to the examination. The results will be declared on or before the 10th of May, 2018. They will be declared on the official website. There are no particular cut-off marks to be obtained expect that in order for one to qualify for admission via JKCET, they should have obtained at least 50 percent of the total marks in their board examination. This is 40 percent in case of students from the Scheduled Caste and Scheduled Tribe categories. College wise cut off ranks depends on the number of applicants and their performance. It varies from college to college and branch to branch. The JK CET Score is valid for duration of 1 year. This means, on attempting the JK CET 2018, a candidate who qualifies will be eligible for admission in the concerned colleges for the academic year 2018-2019. The seat distribution for different branches varies from college to college. The distribution for the above mention colleges is given below. Now that we are done with the discussion about the results let us learn something about the counselling process. And the rest belongs to the General Category students. 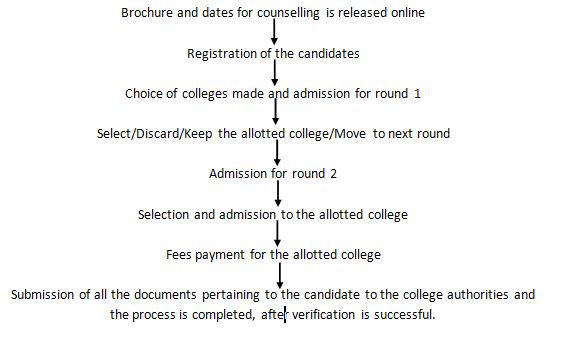 It all starts with the choice entry process, where candidates have to enter their choices for the college or their preferences for the various branches available. Before candidates can enter their choices, a fee of Rs 500 has to be paid at the POS terminal at BOPEE office at Srinagar or Jammu. 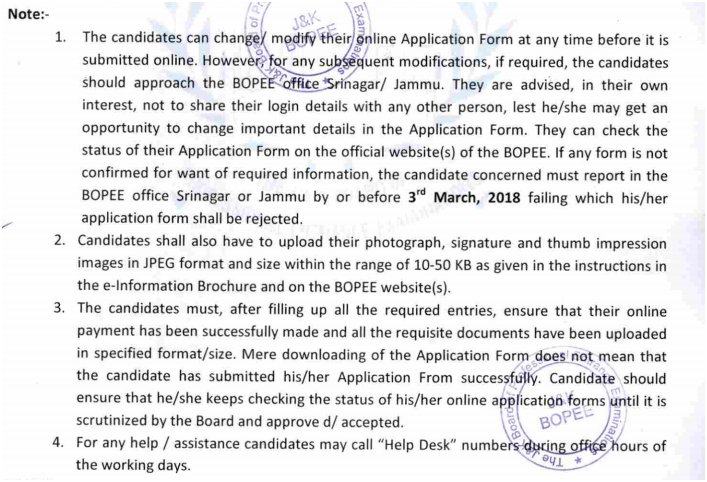 It uses offline mode of counselling and so the Candidates must be present in person for J&K BOPEE counselling. If candidates, due to some reason are unable to attend the counselling, they can send their representatives with the authorisation letter, choice entry and other documents. Original attested photocopies of Permanent Resident Certificate, Marks Certificate and other mentioned certificates. The candidates can check with the previous years’ cutoffs for the different available colleges in which they desire to join and can make their choices accordingly. Candidates will be given seat allotment of JKCET 2018 after the counselling procedure conduction. JKCET 2018 seat allotment will be done on the basis of candidates’ merit and choice filling. Candidates will have to report at the allotted institute during JKCET 2018 seat allotment. I hope this gives you a clear idea about the overall admission procedure if you are opting the JKCET and want to take admission in the Engineering Courses being provided by the colleges in the state of Jammu & Kashmir only. The entire process of admission is to be completed before the 15th of August for the academic year of 2018-19.